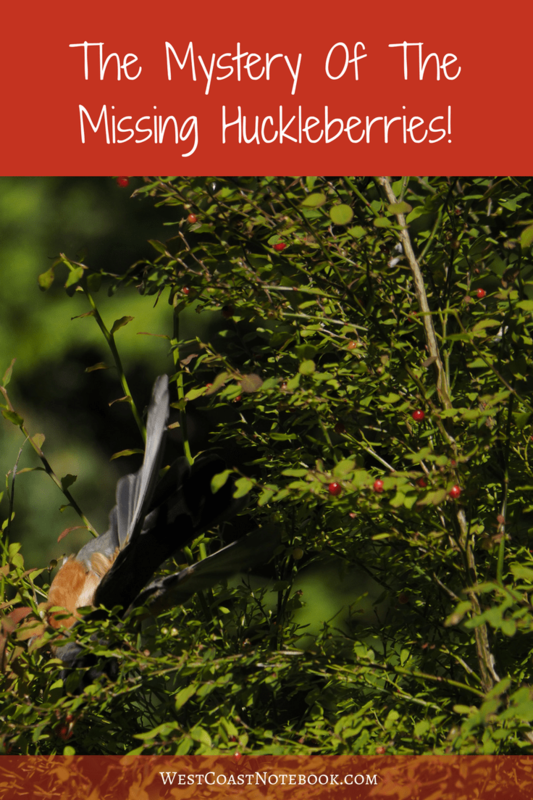 The Mystery Of The Missing Huckleberries! 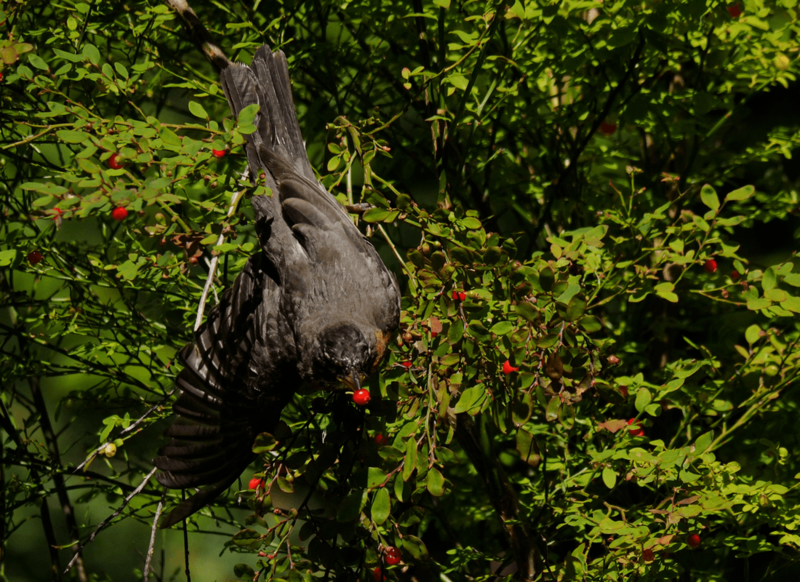 / The Mystery Of The Missing Huckleberries! But really it’s not. I went out to pick some huckleberries to make some jam or muffins from our huckleberry bush and found that all the ripe ones were gone. Disappeared completely only leaving the unripened ones to pick. So leaving them on the tree I watched over the next few days as the fruit ripened again to see who was getting there before me. Turns out I had numerous culprits and all of the of the flying variety. It started by me noticing that the branches were waving about so I got out the handy binoculars for a peek. Turn out it was a European starling. The good news was it was an immature one and it didn’t invite the rest of the flock to join in. 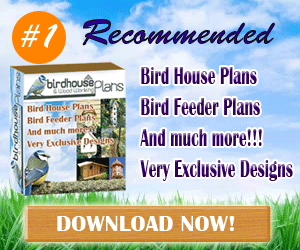 Next, I saw a flock of about 8 house finches fly into the bush and started munching. I don’t think that it’s their food of choice though as they left after only a few bites. 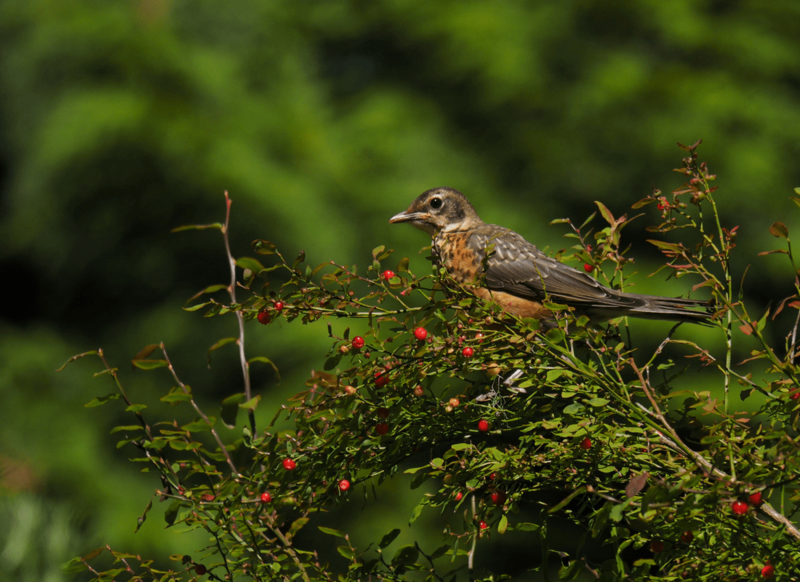 After them came a juvenile American robin. 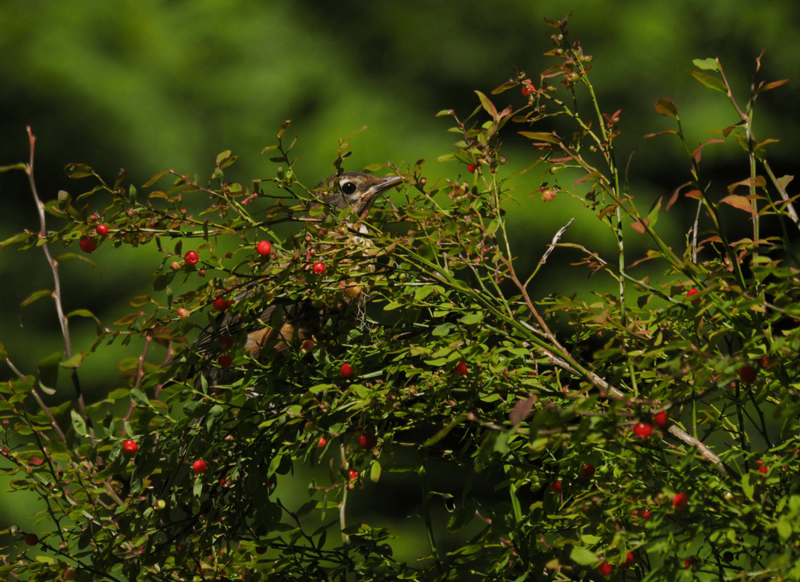 It was his first experience with a huckleberry bush and although he was having a feast, he kept falling off the branches as they dipped with his weight. And then there was the expert! The adult Amercian robin. This obviously wasn’t their first huckleberry bush and wouldn’t be their last. They just tied into it like there was no tomorrow and it was poetry in motion. He dipped, he swayed and the tree became alive with his movements. He leapt from branch to branch disappearing at times in the middle of the bush when a branch bent down under its weight. He would literally dive into the bush, arse over tea kettle to get a berry. It was like watching a dumpster diver. 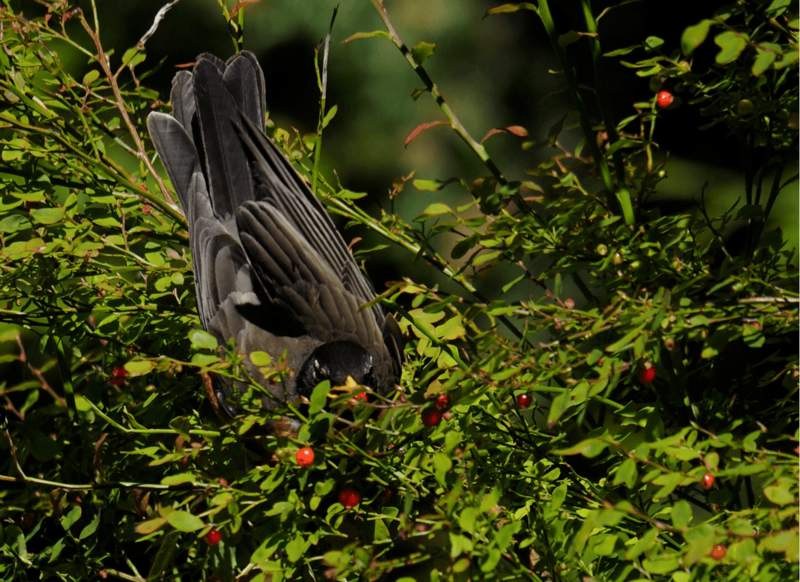 But every time he came up with a berry in his beak. 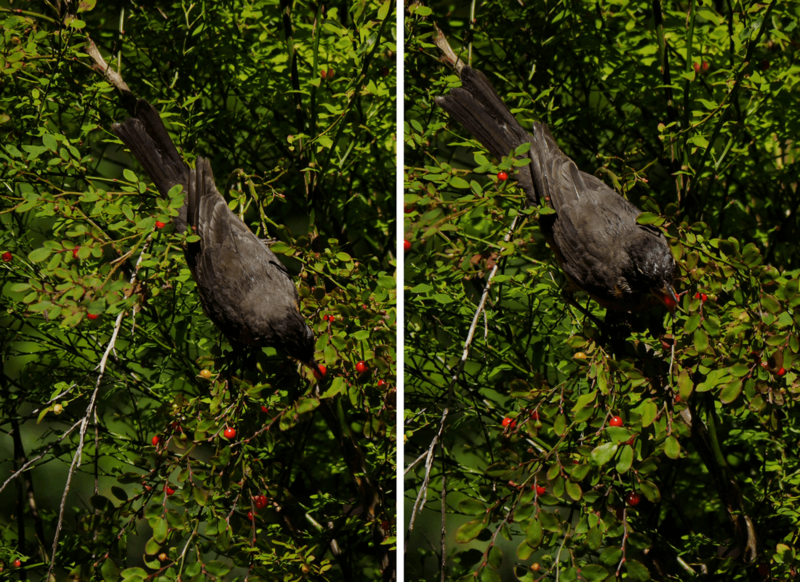 And he was very selective to only pick the juicy red ripe ones. 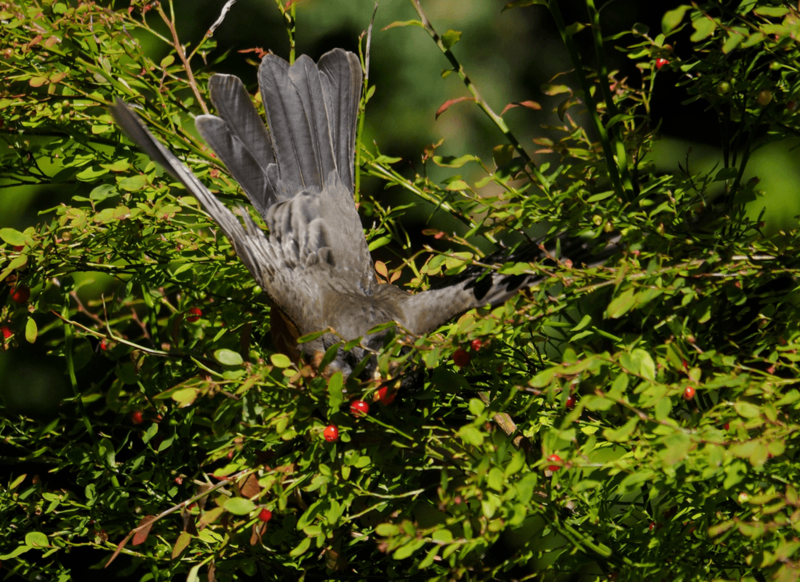 Swallowing them down, he went on to the next and in no time at all the red huckleberries were gone off the bush leaving the rest to ripen another day. So I figured that if I wanted berries this year I was going to have to net the bush and fight off the birds. Instead… I opted to give the birds the huckleberries as I already netted the strawberries and blueberries to keep them out. 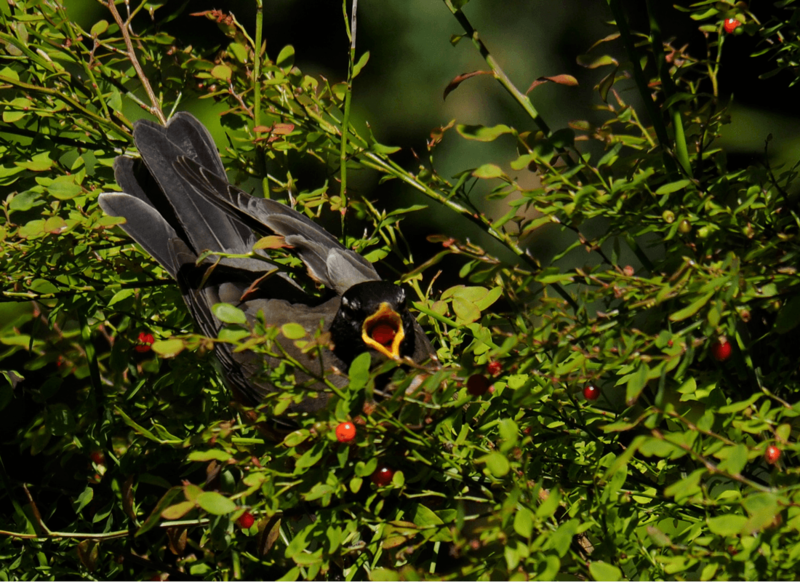 As the modified saying goes… the huckleberries have gone to the birds.